Does your breakfast lack team spirit? Spice up the most important meal of the day with this Pangea Brands® ProToastTM 2-Slice toaster. The retro-style appliance leaves the mark of the Arizona Diamondbacks emblem on every piece of bread. 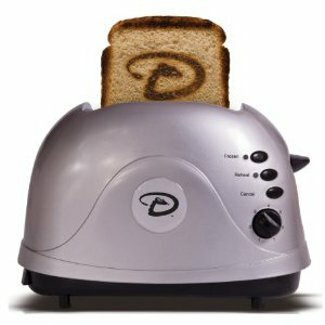 Features the Diamondbacks logo on the outside and toasts your bread in the Diamondbacks logo. Adjustable settings for desired toasting levels. Includes a setting for frozen breads. Works on white and wheat bread, as well as frozen waffles and English muffins. Made in China, final assembly in USA. UL tested and approved. Dimensions: 8'' H x 12'' W x 6'' D.